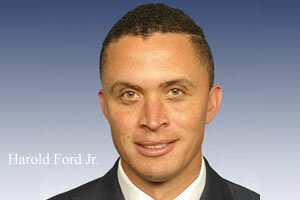 Harold Ford Jr. will address gay political group Stonewall Democrats in New York City Wednesday, the New York Daily News first reported. The former Tennessee representative, who now lives in New York, is contemplating a challenge to New York Senator Kirsten Gillibrand for her Senate seat. HRC, the largest gay rights advocate, recently endorsed Senator Gillibrand's 2010 reelection bid. Ford, who twice voted for the Federal Marriage Amendment, a bill that sought to define marriage as a heterosexual union in the U.S. Constitution, recently announced he now favors granting gay couples the right to marry. The thirty-nine-year-old politician's change of heart has been widely criticized by gay activists. “I know a snake oil salesman when I see one,” Empire State Pride Agenda Executive Director Alan Van Capelle said. “A lot of people don't like him, and I have a feeling they're going to be a little hostile,” he added. Seventy people have already accepted a Facebook invitation from New York-based gay rights group The Power to protest Ford's appearance. “Stop this anti-gay candidate from running for Senate in New York,” the group Crash Harold Ford, Jr.'s Address to Stonewall Democrats NYC says. Former New York Governor Eliot Spitzer is also rumored to be considering throwing his hat into the Senate contest.